As stations enter fall fund drive season, a Ohio public radio station is letting some listeners opt out of hearing fundraising messages. WKSU in Kent will debut a pledge-free web stream during its fall fund drive Sept. 19–27. Sustaining members will be able to enjoy the station’s programming during the drive without being asked to support it financially. The stream will be available on WKSU’s website and through the station’s mobile app and an Alexa skill. Pledge-free streams are not new to public radio or even to WKSU. The station’s new stream was inspired by a similar pledge-free stream for its Folk Alley web service, a spokesperson said. 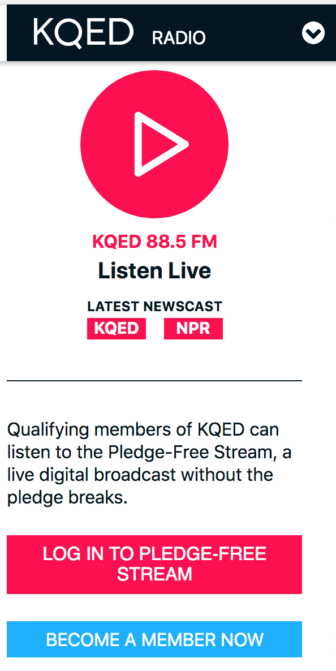 A screenshot of KQED’s pledge-free stream. San Francisco’s KQED began offering a pledge-free stream in 2011 as a member benefit for sustainers. Several stations followed KQED’s lead, but the resources required caused some stations to drop them shortly afterwards, according to Melanie Coulson, executive director for member station services at Greater Public. Costs are low, but the streams require an announcer to record spots that cover the pledge breaks. Station staffers considering investing in a pledge-free stream should ask whether the efforts would improve the drive, Coulson said. What will it require to pull off? What’s the desired outcome? Will it raise more money from new members, the people stations really need to reach during drives? “On air still is the main driver of new members for radio,” Coulson said. Sustainers and long-time givers understand that stations have to hold drives to sustain themselves, Coulson said. On-air drives might even encourage sustainers to make additional donations. “They know their end of the agreement, and they’re used to it,” Coulson said. Some public broadcasters say they’re apprehensive about pledge drives, but the events are still key to stations’ business models, Coulson said. “They’re not going away anytime soon, so what can we do to make them as great as all the other programming we put out on the air?” she said. But pledge-free streams do help remove a barrier for audience members who want to listen to the station’s programming and not the drive. “It’s never a good strategy to annoy your most loyal customers, your most loyal audience,” said Tim Olson, KQED chief digital officer. KQED does little to promote the benefit. Sustaining members learn about it mostly though emails and on-air promotion. The stream draws users in the low thousands during each drive. “It’s for a relatively small but very loyal and important constituency of our sustaining members,” Olson said. First, the cost. Each of the stations I spoke with had to run a parallel studio in order to offer a stream without pledge break appeals. This cost can be considerable. So, when considering this option, do an honest cost-accounting. analysis. And an opportunity cost analysis. Second, its not a big motivation for donating. You’d think it would be, but research says otherwise. The first piece of evidence is the 2015 sustainer study by NPR. It found only 14% of listeners who chose the sustainer option strongly agreed that having a pledge-free stream was an important reason. This was confirmed when I spoke with a large station who was at the time offering the pledge-free stream. Only around 10% of donors who took a premium chose the pledge-free stream option. Assuming half of donors choose a premium, that means the offer resonated with around 5% of donors during the drive. A better way to drive sustainer increases during on-air fundraising is to focus on the “big 3” motivations as identified in the 2015 NPR study: 1) convenience; 2) providing ongoing support to the station; and 3) knowing they are making making their community a better place. We’ve tested this messaging again and again and it is one of the most effective tactics you can employ. At one station, we were able to nearly DOUBLE the sustainer rate (from their on-air drives average of low-30% sustainer rate to just under 60%). Be relentless in messaging it this way. It works. My take on this: if we’re putting a huge amount of resources and effort into building something around our on air drives, it should be something that actually drives results and makes our drives more successful — something that helps us do a better job of member acquisition and Sustainer conversion. And a new purpose of drives now is to upgrade our Sustainers. That purpose should also be part of what we are doing on air.